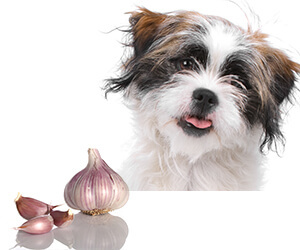 HomeBlogfeaturedHow much garlic is safe for your dog? Garlic has long been used as a safe medicinal plant in holistic medicine for people, and pets as well. There has, however, been a lot of controversy surrounding the safety of garlic on dogs (and cats) due to its properties as a member of the Alliumgenus, a branch of the lily family, along with onions and shallots. Garlic has always been deemed as a miracle herb with powerful antioxidants to destroy bacteria and in the case of our pets, to rid them of fleas and ticks. The confusion about garlic (the miracle herbs), I suspect, came after the major recall of most of the commercial pet food brands a few years ago, when melamine was found in pet food. After that, many people moved away from commercial processed food and moved towards natural, home-prepared meals. The industry retaliated by printing silly information to recover market share, which included ridiculous claims about the dangers of garlic. I have written much on this subject and had to defend the benefits of garlic many times. Like everything in life, “anything in excess is dangerous”. Onion and garlic were tested in a laboratory for their possible dangers. The important finding was that it is dose dependent, “typically involving doses exceeding 0.5% of the subject animal’s body weight”. This means that a 20kg dog would have to consume a minimum of 100gr of onion or garlic (two whole onions or quarter container of garlic) just to start the Heinz-body process. “This grotesque overdose would probably have to be repeated several times on a frequent basis to cause permanent harm”. To put it in perspective, when feeding wet food, like Vondi’s (500 grams), you would have to feed 120 packets per day, to reach the possible toxic level. But you wouldn’t do this! They also, categorically concluded that “small doses of garlic are probably going to be of great benefit to the overall health of your pet “. In other words, the inherent benefits derived from consuming garlic over-rides any of the possible dangers. It was also noted that whilst onions are classified as part of the garlic family, the actual properties of garlic were different and potentially less “dangerous”. In summary, common sense should prevail & pet owners would only include reasonable quantities of garlic in their pets meal. The exceptions would be pets that have an existing Heinz-body anemia ailment, and for puppies under the age of 6 weeks (they should be suckling at that age anyway). GARLIC – is a miracle herb and has a powerful natural disinfectant which helps to destroy harmful bacteria in the animals system and helps detoxify the body. It also tones the lymphatic cells and helps purify the bloodstream and intestines. It prevents viruses from multiplying and creates hostile conditions that repel most parasites and strengthens the immune system. Garlic has been used for thousands of years as a medicinal herb; in fact, Hippocrates advocated garlic for infections, cancer and digestive disorders. The great Roman naturalist, Pliny the Elder, also recommended garlic for a wide variety of ailments, ranging from the common cold to epilepsy and cancer. Modern science has also established the fact that garlic boosts immunity, gets rid of bacterial, viral and fungal infections, enhances liver function, helps detoxify the cells in the body, lowers cholesterol and triglycerides in the blood and even fights cancer.